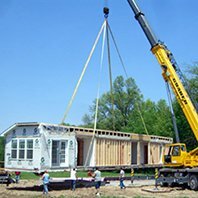 Every home and building site is different, so the process varies by project, but our professional construction and installation crews make the process as enjoyable as possible. 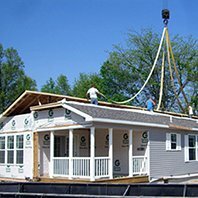 Installation buy our construction team ensures your home is set and finished properly and will bring years of security and enjoyment. 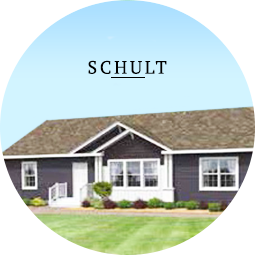 All construction and installation is performed by a Premier Homes crew. 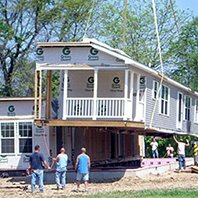 Home is positioned for lift by crane. 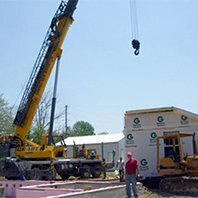 First unit is placed into position on your foundation or basement. Depending on the style of your home, the next piece is then positioned. 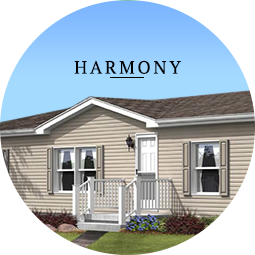 Your home is joined together and ready for roof work and exterior finishes. 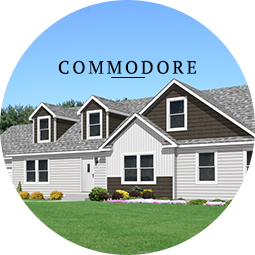 Watch in amazement as your beautiful new home is finished inside and out with your landscaping touches. 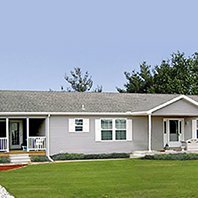 Premier Homes offers a wide variety of customizable homes. Choose from dozens of floor plans and styles like Ranch, Cape Cod, Two Story and single section homes built by industry leaders such as Commodore, Harmony, and Schult Homes.